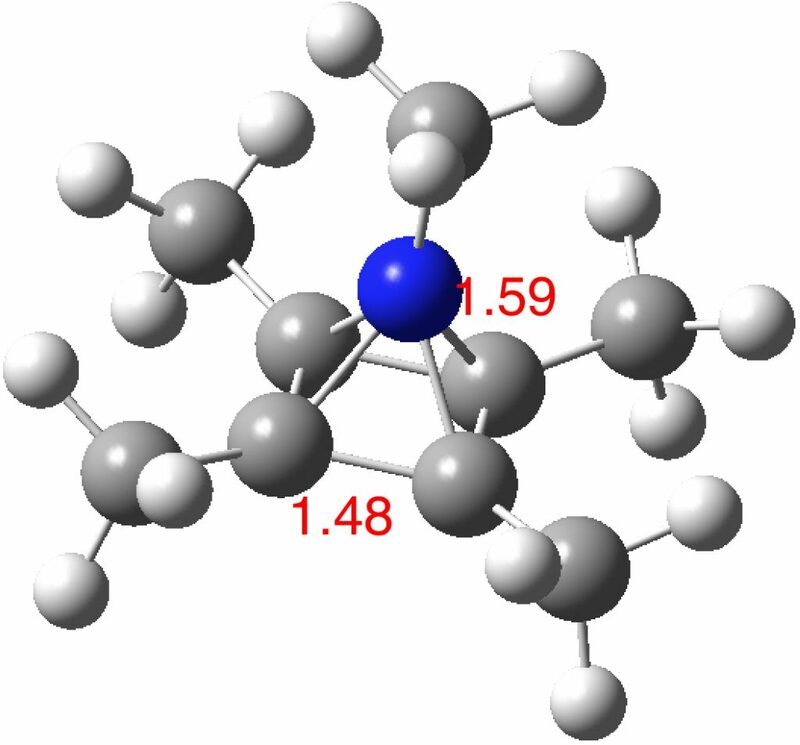 First, a search of the CSD (Cambridge structure database) for such nitrogen. There are only three hits, ,  all of which relate to RN bonded to four borons as part of a boron cage. There are none which relate to RN bonded to four carbon atoms. The original argument was based on cyclopentadienyl anion and its symmetric coordination to RC3+ to achieve six coordination for one carbon. Morphing C to the iso-electronic N+ gets one to the ligand RN4+ and this can now be coordinated to the di-anion of cyclobutadiene, also iso-electronic in the 6π sense to cyclopentadienyl mono-anion. The optimised structure of the methylated system (ωB97XD/Def2-TZVPP) as shown below (DOI: 10.14469/hpc/2348) is a true minimum and reveals a 5-coordinate nitrogen. It is the dication of an isomer of pentamethyl pyrrole. One of the normal modes for this molecule is the so-called Kekule vibration, which elongates two C-C bonds and shortens the other two. The value (1266 cm-1) is typical of aromatic systems. 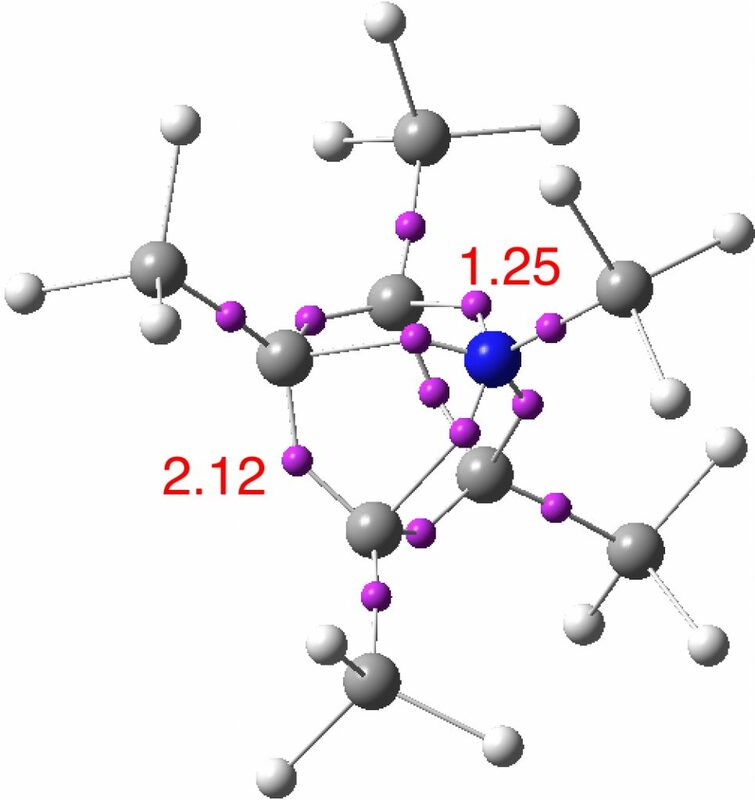 A QTAIM analysis shows four line (bond) critical points (LCP, magenta) connecting the 4-carbon base of the system and four further LCPs connecting each carbon to the nitrogen. Significantly, the four carbons are not themselves characterised by a ring critical point (RCP, green), these being confined to the rings formed between two carbons and the nitrogen. The value of the electron density ρ(r) at the basal bond is typical of a single bond; the value to the nitrogen indicates the bond has a smaller order. An ELF (electron localisation function) analysis is similar, showing basal C-C electron basins of 2.12e and C-N basins of 1.25e. In hunting for examples of hyper-coordination in the second row of the periodic table, the focus has tended largely towards identifying carbon examples. Perhaps that might now right-shift to the adjacent element nitrogen? This entry was posted on Saturday, March 25th, 2017 at 8:14 am and is filed under Bond slam, crystal_structure_mining, Hypervalency, Interesting chemistry. You can follow any responses to this entry through the RSS 2.0 feed. You can leave a response, or trackback from your own site. The 15N chemical shift in this system is predicted to be -25ppm, (nitromethane reference), shifted upfield because of the anisotropy of the aromatic ring current. The 13C of the N-methyl is ~32 ppm. 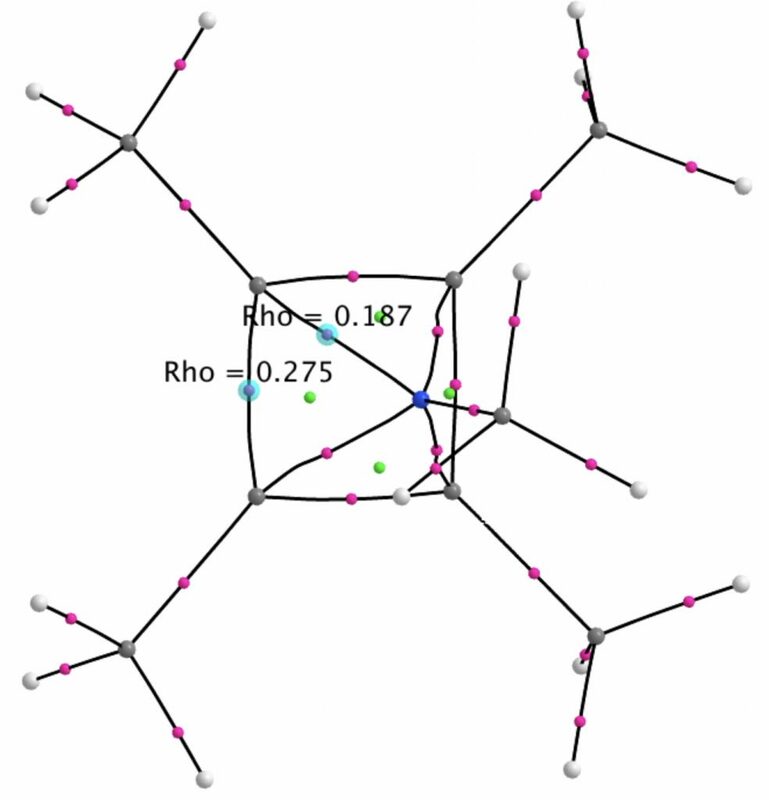 First, hexacoordinate carbon – now pentacoordinate nitrogen? is licensed by Henry Rzepa under a Creative Commons Attribution-Noncommercial-Share Alike 3.0 United States License.